I was really excited to read Red Sister but I have to be honest for a little while I didn’t think I’d even finish it. This is mainly the story of Nona- trouble seems to find her and she winds up in the Convent of Sweet Mercy a school of girls being trained to become Nuns/ Sisters/ Super Assassins which sounded so bloody cool I jumped on it! I really haven’t had much luck or interest in many tv series this year. But I found Little Witch Academy and just speed through the whole thing in like a week and a half. Which is really good for me. I found it on Netflix. It’s the story of a young girl called Akko, who goes off to a witch academy but she’s not that great at being a witch. All I really need is to hear the old Harry Potter music and you can get me into the theatre. Balanced against the fact that I’m not that big on Eddie Redmayne I was however a little worried about this one. Redmayne plays Newt Scamander who comes into 1920’s era New York with a suitcase full of fantastic beasts. Unfortunately due to the suitcase not working all that well and a mix-up some of the beasts get released into the city and Newt and friends must find them before they get into trouble. Every generation a set of female triplets is born to the Queen. As children they are taken and fostered out to three families to perfect there “gifts.” In this generation Mirabella is an elemental, Katharine a poisoner and Arsinoe a naturalist. These three sisters then get a year to do all they can to kill each other and the last one standing gets to be Queen. 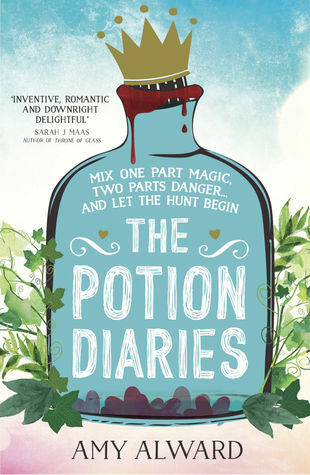 When Princess Evelyn accidentally gives herself a love potion a hunt among Nova’s great alchemists is called to find the ingredients and undo the spell before the Princess loses all control of her magic. The first thing I thought when I read the synopsis of this book (which I read as Madly from Amazon) was that would be me. I mean I would be the girl accidentally giving herself a love potion and falling in love with herself (as Evelyn does). Yep, sounds like something silly I would do. Evelyn is cute and Alward actually does a really good job of not making those scenes too outrageous. But the main character is actually Samantha Kemi, the latest generation of a famous family of alchemists. They used to be the favorites of the royal family but have been pushed out by the big pharmacies and the manufactured synthetic potions they can mass produce. I enjoyed the story. I enjoyed the magic parts and the scavenger hunt aspect and liked the fact that Sam was a smart character who was not above the ambition to put her family back where she believed they belong. Even if it meant (sadly) making a few mistakes and stabbing a few people in the back along the way. For what it was I thought the world-building was pretty good here. There’s a lot of history between the Kemi’s and the royal family as well as some of the competitors. The admittedly small inclusion of the media was a nice touch to provide a bit of world color along the way. I thought the romance with the son of her main competitor Zain Aster (also from the family who stole from her family) was fairly bland. On top of being pretty typical for this type story. Can you trust him? Does he really like her? Can you feel sorry for him or is it all just a ploy? I thought Evelyn’s relationship with herself had more chemistry. I honestly wish Sam and Zain had been way reduced or completely left out so that it was just Sam, her family and the hunt with interludes of a losing control Princess Evelyn along the way. Recommend: Yes. It’s a fun fast little fairy tale for people who like magic and globe-trotting scavenger hunts.